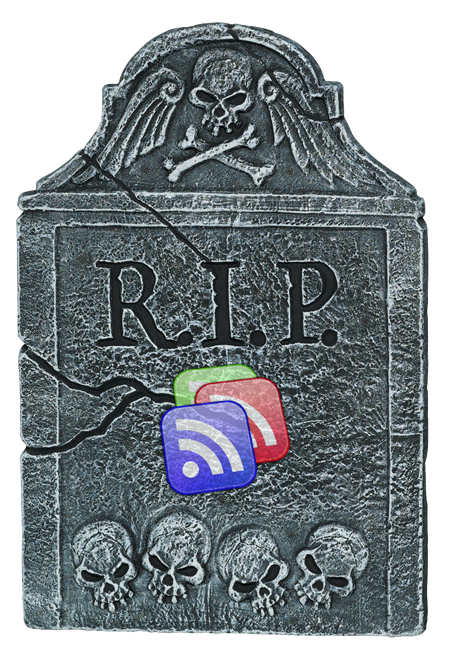 As I am writing this, in a google Drive Doc no less, the rage over the recent announcement over the eminent demise of google reader still stands strong. More than a week on from the announcement, the removal of the link to the reader from some of google’s services menus seems to have refueled the rage and sadness of all the loyal fans of google’s RSS (Really Simple Syndication) application. Although saying that the whole world was shattered is definitely an exaggeration, but the disgruntled users that signed Dan Lewis’s online petition, more than 145.000 now, the gain of another 500.000 users for the celebrated alternative feedly and the rising numbers of old reader, the three person team project, and that of other rss alternatives speak volumes. Google says that the declining numbers, of users and traffic, are the cause of the shut down but Reader, according to BuzzFeed Network, drives more than 40 times more users to sites than Google+ and those are the users that Rupert Goodwins calls “busy information VIPs” and that is a crowd that any social network should cherish. Is it money then? Apparently reader never tried to make any money and, some say, even if it did it would be very hard to do so. But why, isn’t Facebook, or google+ for that matter, in a way an RSS feed? Why is it hard to incorporate ads, especially content targeted ads, to reader and it isn’t hard for gmail, Facebook or even twitter? There is however an even darker side to the closing down of google reader, that borders with conspiracy theory, and that is that in countries with “less” freedom of speech and more censorship google reader is the best workaround. Apparently the infrastructure, redundancies and servers of google make it harder for censors to block it and easier for the people to gain access to the information they are so deprived. The theory sounds far fetched, but given the way google gave in to china’s censorship request, I can see Google giving in to pressure in order to enter or grow in some markets. Google Reader, for me, was a one-stop-shop for my daily dose of all things of interest to me after news and email. I used it more that facebook and twitter and definitely more that Google+. It served as a content provider for all my social outlets, my trend spotting and a good part of my online entertainment. But that is not a problem because there are other services to fill that void. And although at least 24.000.000 users (the CNN feed has more 24.300.000 subscribers) might be nothing to Google, to small, agile and success hungry startups that number is a reason to risk and innovate. So in terms of the actual service we might even be better off with the death of the leader. It’s not even the fact that the shutdown of Google Reader constitutes a betrayal of the trust that people showed to Google by choosing to invest in a service, and upon which the company relies. Although it’s those people, few compared to the whole of the Google’s reach but probably very influential, that will inevitably begin to question the continuity and reliability of other services and start supporting those who fight Google. I know I will be more reserved from now on. Google’s main failure, for me, is that they failed to see the potential of google Reader, even after the spectacular fail of Buzz, for entering the social arena through the back door. That is by providing the content and building around that service, a social network for those that are looking for something different than facebook instead of taking it head on. Even after Google+ plus came I still hoped that Google would not only integrate reader into Google+ but they would also take advantage of it. They didn’t and that not only drives me further away from an already dull, in terms of content at least, Google+, but it also makes me worry about my dependance on Google and it’s services but, possibly more importantly, makes me doubt Google’s future and purpose. And of course I really don’t want to give Keep a go.